Things have been VERY hectic around here lately. 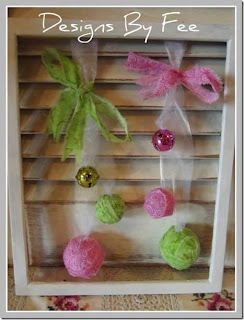 I have been doing lots of secret stuff including this tutorial which is beiong shared over on Kerryanne's blog today as part of Simply Christmas. I have chosen a winner for the Quilt name - I'll be back tomorrow to announce it. I am so thrilled and grateful to have you as a guest blogger on Simply Christmas today Fee. Your pink and green shabby raggy baubles are gorgoeus. I have to say I love your header Fiona. So darned cute and cheerful. I also love your Christmas project, the colors are so refreshing besides the usual kinda dark red and green. Love the pink and that lime green. So pretty. So glad to see several more color variations for Christmas now. Your blog is great and I'm a new subscriber. I so enjoy "meeting" bloggers and signing up to keep up with all your creativity that really inspires me. I'm older (72) but enjoy seeing so many wonderful projects and the incredible ideas bloggers come up with. To me it's so refreshing to know people are still using their imaginations to create wonderful projects and redoing old furniture. Happy week/weekend.